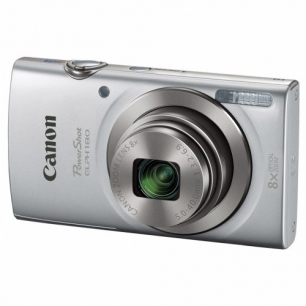 The slim, stylish PowerShot ELPH 180 camera has easy-to-use features to help create stunning photos. The 8x optical zoom lets you get close to the action, while the 20.0 Megapixel CCD sensor with DIGIC 4+ image processor help produce vibrant, clear images to share or print. Take more than just still images, with the ability to record movies at 720p HD. For added convenience, Smart AUTO figures out suitable settings for what you're photographing so you don't have to worry about finding a picture mode yourself. To help reduce the effects of camera shake, Digital IS helps keep blur to a minimum. On top of that, the Auto Zoom feature can automatically close in on your subject and keep it in focus for easy shooting.